If you’re like me, at least one TED talk has sent you scrambling for your phone to tell someone about it. The presentation was so captivating you just had to share it. And though the subject might be anything from sub sandwiches to subatomic particles, the truly memorable talks usually share one thing in common. The speaker has an effective delivery. This is not to say they are always polished public speakers. Sometimes they are the opposite. But they all tell a clear and compelling story. They have the ring of authenticity in their voice. Most of all, they are honest. I ran across an interesting post by Chris Anderson, one of the founders of TED, who says his first TED talk was a disaster. It happened in the early 2000s, when TED was struggling and Anderson was taking over as leader. 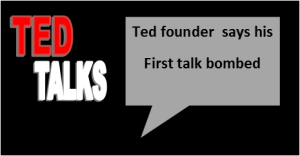 He was invited to address a conference of TED stakeholders concerning TED’s future. Many were in favor of pulling the plug altogether. As with all speakers, he had 15 minutes to make his case to keep TED going. Anderson says he was so nervous when he took the stage he rolled a chair forward and sat down instead of standing. Anderson’s talk was a smash. He took over the company and the rest is history. Today TED is an institution. “There were many things wrong with that talk, but it succeeded in one key aspect. It was the idea that what was truly special about TED was not just the founder I was taking over from. TED’s uniqueness lay in being a place where people from every discipline could come together and understand each other. Its future was for all of us. Your job as a speaker is to take something that matters deeply to you and make your listener care about it too. Doing this is not about acting ability, stage presence or smooth talking, as Anderson;s example illustrates. It’s about having something worth saying.